Local Tips: Your journey will start in Luxor and you may discover such wonders as Karnak and Luxor Temples, the Valley of the Kings, and more! The SENTIDO M/S Mahrousa features 56 deluxe outer cabins and junior suites equipped with onboard telephone, Satellite TV, mini fridge, safe box (free of charge), air conditioning, shower and WC. 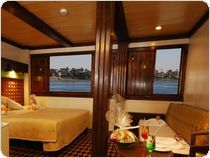 Located on the top deck, the junior suites are more spacious and have a sitting area. Food, drink and entertainment: Full Board with an option for All Inclusive. The ship has an international buffet restaurant and 1 lounge bar & 1 sun deck bar. The freshly prepared Egyptian and international specialities cater to a high standard that will leave no wish unsatisfied. There is a varied evening entertainment program. 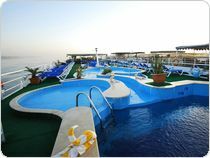 Sports, games and activities: Sun deck with Small swimming pool, Sun beds, beach towels, umbrellas free of charge. Countless historical attractions – this is Egypt! Relax with a massage (for a supplementary charge) and enjoy the fitness machines (free of charge) and billiards (for a supplementary charge). Additional: Holiday Concierge (Tour Leader!!!) 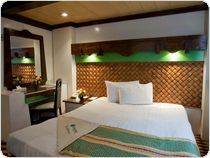 on board (your holiday planner), Room service available (at extra charge) late breakfast available, W-LAN in all common rooms and guestrooms, shuttle service, daily newsletter which includes information on the region and activities. - East Bank: KarnaK and Luxor Temples.